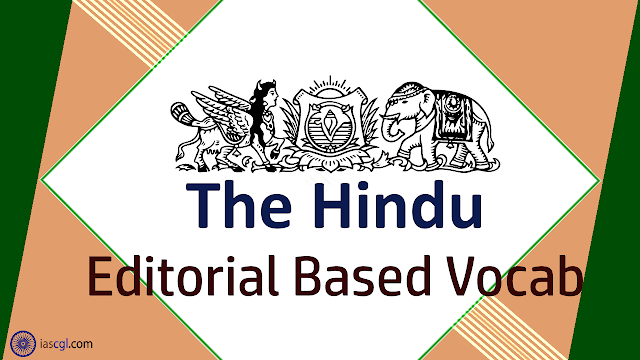 HomeVocabThe Hindu Vocab 22nd September 2018 For Competitive Exams. The Hindu Vocab 22nd September 2018 For Competitive Exams. Vocabulary from The Hindu Editorial 22nd September 2018 for Staff Selection Commission(SSC) Combined Graduate Level, Combined Higher Secondary Level, Bank PO, Clerk and other state Government Examination. Within 24 hours of announcing a meeting between External Affairs Minister Sushma Swaraj and Pakistan Foreign Minister Shah Mahmood Qureshi in New York next week, India called it off. The reasons cited for this overnight flip-flop are recent attacks in Jammu and Kashmir by Pakistan-based groups, and stamps issued by the Pakistani postal service that glorified Kashmiri terrorists. According to the MEA spokesperson, both acts “expose” Pakistan’s “evil agenda” and the “true face of the new Prime Minister of Pakistan, Imran Khan”, rendering talks “meaningless”. While the government is well within its rights to rethink any decision it takes, the reasons that it has furnished for cancelling the meeting are far from convincing. To begin with, there have been a number of violent attacks in J&K in the past few months which predate the government’s decision to schedule the meeting. Since the beginning of the year, 13 Border Security Force jawans have been killed along the Line of Control and the International Border, including the latest case on Wednesday of a jawan’s body recovered bearing torture marks. In the same period, more than 20 policemen belonging to J&K police have been killed by terror groups backed by Pakistan. The government’s reaction to Friday morning’s killing of three policemen thus appears puzzling. Equally bewildering is the subject of the stamps of Kashmiri terrorists; while there is no doubt that they are offensive, they were issued back in July before Mr. Khan came to power. The government needs to clarify its position on what prompted the cancellation of the meeting, not just for the domestic audience but also for the international community which is watching the India-Pakistan relationship very closely. The decision to cancel the meeting in New York dampens hope for meaningful engagement between the two countries for the foreseeable future, perhaps until the general election in India in 2019. Delhi and Islamabad should use this period to bring down tensions. In particular, the situation on the LoC warrants immediate attention. A day before the killing of the BSF jawan, a statement by the Defence Minister that the Indian Army is “also cutting heads, but not displaying them” only highlights the need to stop the retaliatory cycle. The new hotline just operationalised between the BSF and the Pakistan Rangers is an important initiative in this regard. India’s decision to call off the New York meeting is only the latest in a series of cancellations of talks with Pakistan since the Modi government came to power. There is little doubt that provocations from Pakistan, and the seriousness of the attacks launched by groups based there warrant a firm signal from India. But a credible position also requires consistency, which the government has not brought to bear on its Pakistan policy thus far. Glorified: गौरवान्वित - (especially of something or someone ordinary or unexceptional) represented in such a way as to appear more elevated or special. Furnished: सुसज्जित - planned; (of accommodations) available to be rented with furniture. Predate:उचित समय से पूर्व तिथि डालना- exist or occur at a date earlier than. Torture: अत्याचार -the action or practice of inflicting severe pain on someone as a punishment or to force them to do or say something, or for the pleasure of the person inflicting the pain. Puzzling: उलझन -causing one to be puzzled; perplexing. Bewildering: हक्का-बक्का करनेवाला - cause (someone) to become perplexed and confused. Offensive: अपमानजनक - causing someone to feel deeply hurt, upset, or angry. Dampens: उत्साहहीन करना ;निस्र्त्साह करना - dishearten; make less strong or intense. Foreseeable: निकट- able to be foreseen or predicted. Retaliatory: मुंहतोड़ - violently break (something) into pieces.